I’m writing this Quechua NH100 hiking boots review sooner than I would have liked to do. My previous hiking boots were made by Karrimor and I reviewed them after I’d been using them for two years because that’s how long they lasted. At the time, I said they were the best boots I’d ever had and that still holds true. I bought my Quechua NH100 hiking boots six months ago, now the only trip they will be taking is a short one. They’re headed straight for the bin. I stepped in a puddle the other day and my left foot got wet. I checked the sole of the boot and discovered it had split. It’s a disappointing state of affairs. My Quechua NH100 hiking boots were unable to go the distance, I’m getting that out of the way right at the start of this review. However, I cannot condemn the boots completely. To be fair, they lasted longer than many other boots I’ve had in the past. They were also a very cheap pair of hiking boots to buy. I bought them from the Decathlon store in Granada and only paid around €15. I chose these boots for three reasons. The first reason was the Decathlon store was relatively close to where I was living in Granada. The second reason was the price. We Yorkshiremen can be mean buggers when it comes to spending our money. The third reason was curiosity. I was curious to see if hiking boots that were so cheap to buy would last more than a few weeks. Having said that, I still did all my normal checks before I bought the boots and the quality of the sole seemed pretty reasonable. If the store had had any Karrimor hiking boots in stock, I would have bought them instead. It didn’t. If I had to take a chance on an unknown brand, I figured it may as well be one that was kind to my pocket. Don’t kid yourself that you get what you pay for. I’ve bought plenty of expensive footwear in the past that ended up being bin fodder in a matter of just a few weeks. I’m not exaggerating. I walk a lot. My footwear works hard. The first time I wore my Quechua NH100 hiking boots it was a warm day in Granada. The temperature was well over 30 degrees. I don’t know if that had anything to do with it, but every time I took a step I heard the soles squeaking on the cobbles. I found it a little embarrassing as I squeaked my way past people coming in the opposite direction. After a few days, the squeaking stopped. I also noticed the soles did not grip the cobbles too well. On grass, they would have probably worked just fine. On the cobbles, I felt my feet slipping a number of times. Again, the problem went away after a few days. The other thing I noticed was Quechua NH100 boots are a lot more lightweight. They did not feel so heavy on my feet as my previous hiking boots did. There’s nothing wrong with a lightweight hiking boot. However, it has to be said the material used for the uppers was much thinner than the material used for my Karrimor hiking boots. The Karrimor were durable, heavy-duty hiking boots with plenty of padding around the ankles. With the Quechua NH100, there simply was not a lot there. I would not have wanted to wear them for a serious hiking trip in the mountains. One little slip and my ankles would have been hit hard. Right from the start, I had the impression Quechua NH100 are a better option for people who are doing light walking in streets and along unchallenging country trails. Anything more than that I don’t think they would be fit for purpose. The thing I did like about my Quechua NH100 hiking boots is they looked more like trainers than hiking boots. When I was wandering the streets with my Karrimor hiking boots on my feet I used to feel a little self-conscious every time I popped in a bar or cafe. More often than not, I was the only person wearing hiking boots. With my Quechua NH100 hiking boots that wasn’t a problem. Due to the fact that the fabric is so thin, Quechua NH100 hiking boots are not a good option for walking in Winter. You could try it, but your feet would get very cold. The uppers are made of pretty thin stuff. Even though the fabric is thin and allows your feet to breath, when you wear them a lot, like any other brand of hiking boot, my Quechua NH100 boots began to smell. That’s not a problem as such, but if you are thinking of buying a pair of these hiking boots don’t go thinking you will escape the perils of smelly feet because you won’t. TIP: If your hiking boots start to get smelly, you can control the problem by placing a bar of soap inside each boot when you are not wearing them. Stuffing your boots with rolled up newspaper is another good way to stop your boots from smelling so bad. A review is a personal opinion based on experience and, in my opinion, Quechua NH100 are hiking boots that are best suited for days when the weather is good. If it starts to rain the water goes straight through the upper fabric. There are sprays designed to stop this from happening, but with boots like these, the sprays are unlikely to do much good. The title of this review says it all, Quechua NH100 hiking boots do not have a lot to offer in the way of durability. They are cheap hiking boots that are okay for light to moderate walking when the weather is good, but they are too lightweight to be considered serious hiking boots. Nobody is going to be going trekking in the Himalayas with a pair of these on their feet. In my case, the sole of the left boot split after only six months of use. If a boot is made for walking it needs to last longer than that. After I found the split in the sole I became curious. Had other people had similar problems too? I went online and visited the Spanish version of the Decathlon website and found out I am not alone. Several people have left negative reviews on the site complaining about Quechua hiking boots with split soles. 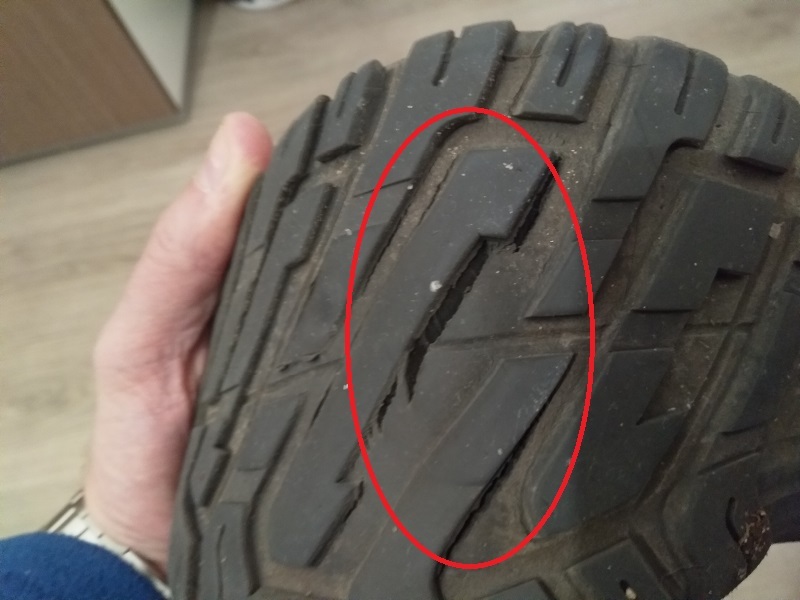 In one case, the sole had split after only a few hours of use. To be fair, there are a lot of positive reviews for Quechua NH100 Hiking Boots as well. In fact, the number of good reviews outweigh the bad but, in my opinion, Quechua NH100 cannot be considered a durable hiking boot. Are Quechua NH100 Hiking Boots Worth the Money? 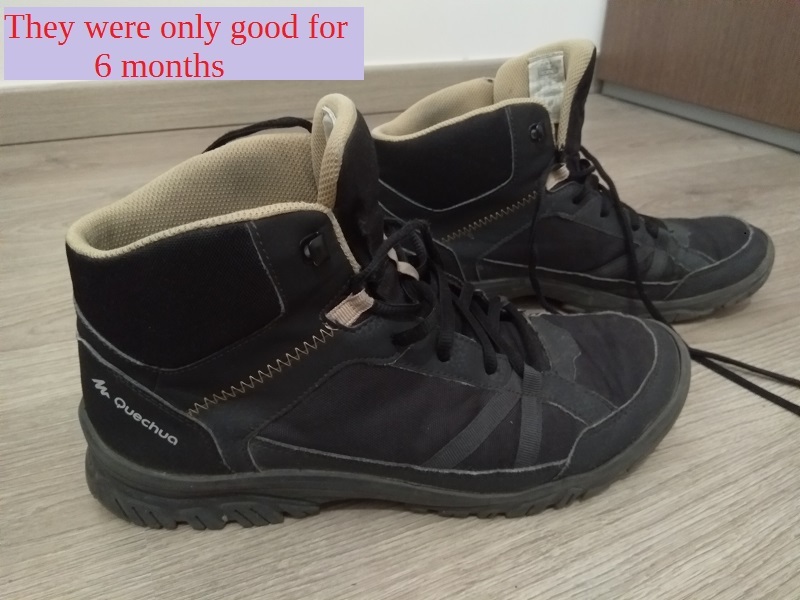 I’m going to end this Quechua NH100 hiking boots review by answering a very important question: do I think they are worth the money? In all honesty, that depends on what you are looking for in a hiking boot. Unless you are only planning on using them for occasional light strolls, a pair of Quechua NH100 is not going to be traveling with you for a number of years. If you choose to walk in rough terrain, there’s a good chance you and your boots will need to part company after just a few weeks. They’re simply too lightweight. Are they worth the money? Yes. I have to admit I think they are, but only if you’re going to be using them in the streets instead of mountain or rough-country terrain. My boots cost €15 and were good for six months. If I bought three more pairs and each pair had a similar lifespan, in theory, I could get four years of walking for €60. For a street boot, I find that acceptable. 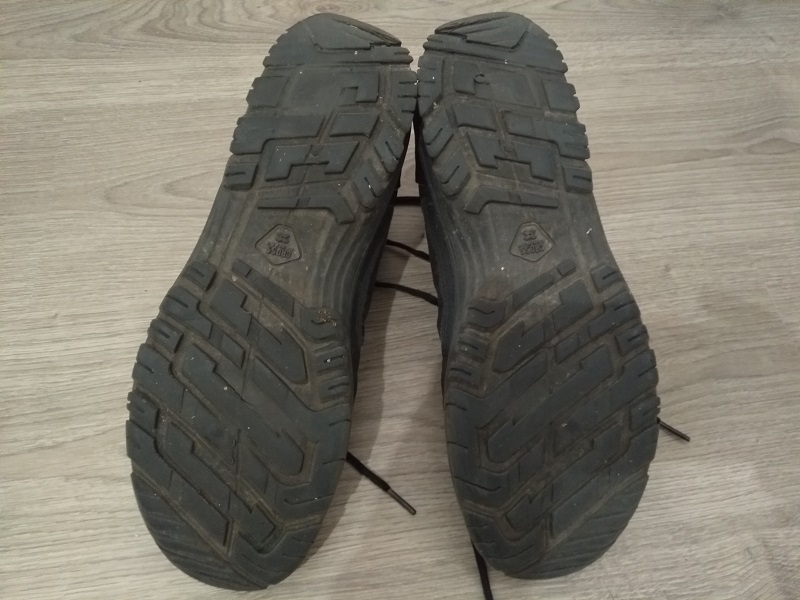 However, I must stress once again, I would not gamble my money on a pair of Quechua NH100 if I needed a good solid boot suitable for serious hiking. I would rather pay more and invest in another pair of Karrimor hiking boots. I know from experience they are hiking boots that are built to last. They are superior to Quechua NH100 in every way. Previous Article Previous Article: The Boscaiola Pizza in Naples Is the Best!